Puppies grow up fast—and choosing the right food for your fast growing fur baby is important. 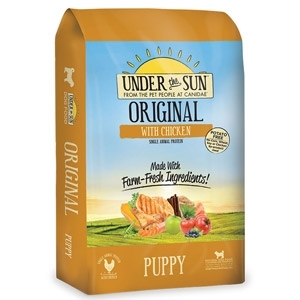 That’s why our CANIDAE® Under The Sun® Original Puppy Food With Chicken is made with quality chicken meal. Chicken meal is highly concentrated with the protein your growing pup needs. In fact, chicken is the single animal protein used in our puppy food recipe. We use a variety of farm-fresh fruits & veggies like carrots and green beans. Our potato free puppy food is also made without corn, wheat, soy, or chicken by-product meal. Choosing the right food for your new puppy is just the first step to many happy years together!